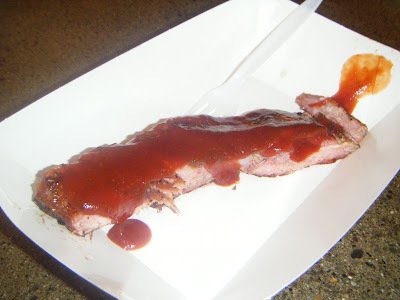 Barbecued Ribs in Seattle? Yeah, I know a guy. Casper the friendly good ‘ol boy. He’ll give your ribs a kick. 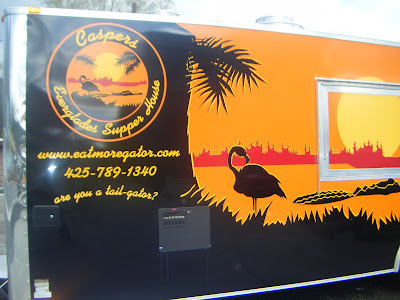 I introduced ya’ll to Casper last year, shortly after the grand opening of his little “Everglade’s Supper Shack” in Lake Forest Park, now known simply as Casper’s or more formally as “Casper’s a Taste of the South.” To my thinking, Casper’s ribs — and everything else he’s selling (did I mention catfish, alligator, frog legs and Bubba’s banana pudding, plus outrageously good sides including fried sweet banana peppers, fried pickles, Bobbie Joe’s coleslaw and uh, Ms. Nancy’s mac and cheese? indeed I did!) . So, you’ll forgive me Ash, if I insist the best ribs in Seattle aren’t exactly in Seattle — unless you’re lucky enough to find one of Casper’s mobile units at a catering or special event. A Taste of the South ready for a moveable feast. I love this joint, where they promise to “put a little South in your mouth” and deliver on that promise. In fact, yesterday, I was driving north on Bothell Way when my car made an automatic pit-stop, pulling up to Casper’s love-shack despite my attempts to keep it nosed north. And once in there, who did I find? That 60-something, gator wrasslin’, pork-smokin’, frog-leg-fryin’ Southern boy, who insisted (as he always does) I try something new. 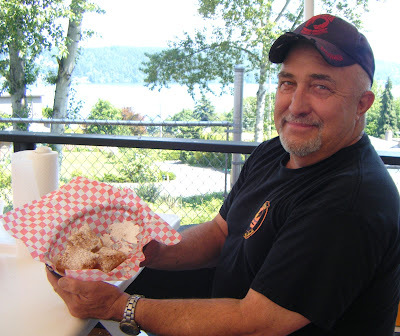 This time it was “just one” of his hot-from-the-fryer beignets, graced with powdered sugar. Beignets and that backdrop? Who can resist? “Oh no! I couldn’t!” I shot back (as I aways do). I mean, after all, I didn’t intend to sit there and eat a pile of lip-smacking, pig-meat-fallen-off-’em ribs to begin with — seeing as I was headed out to a potluck later and taking some of my own homemade ribs with me. But Casper has a way of convincing folks to do his bidding, and while we were sitting out on his fabulous add-on — a tent-covered deck with a panoramic view of Lake Washington where you can knock back a Diamond Knot IPA, though I stuck with sweet tea — I succumbed. Room with a view — and a hefty canvas tent-top plus a honkin’ big heater for when the wind blows a gale off the lake. Yes, I ate a beignet. OK, two. And Casper gave the rest to the fellas who showed up after me, telling him they’re free “cause it’s Wednesday.” “You been here before?” he grilled them. And when they said no he gave them the business, as is his wont. “Well, it’s only taken you 18 months!” I’m awful glad I stopped by yesterday. Not only because it gave me yet another opportunity to revel in those ribs. . .
. . . but because I got some surprising news I could use: Casper’s got a second location, in Bothell, where those ribs are sold from one of his fancy mobile rigs Mondays through Saturdays from 11 a.m. to 8 p.m. And he’s thinking of opening a third location, casting his eye toward Woodinville. 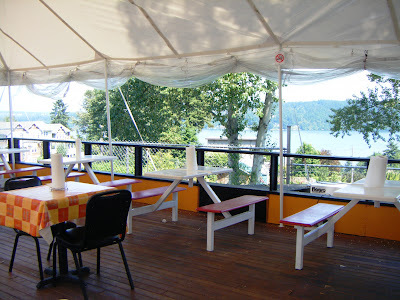 Meanwhile, he’s throwing a party on Saturday June 20 out on that deck: a real Southern-style crawfish boil, with live crawfish flown in special from his “coonass” buddy in Louisiana, says the ever politically correct rib-master. So do yourself a favor, Ash. Go see my buddy Casper. 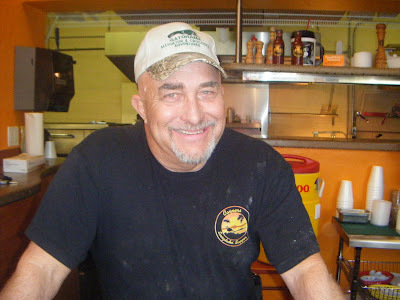 He’s a piece of work whose sassy stamp of Southern hospitality adds a walloping dose of flavor to everything I’ve eaten here. 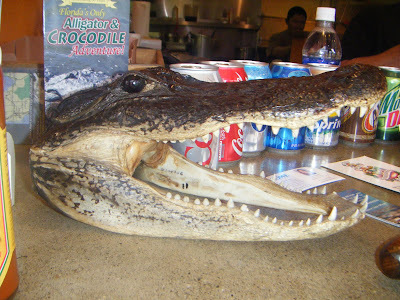 And I’ll bet you a bite of ‘gator you’ll agree. Anybody else care to mouth-off? Where do you go for great ribs?